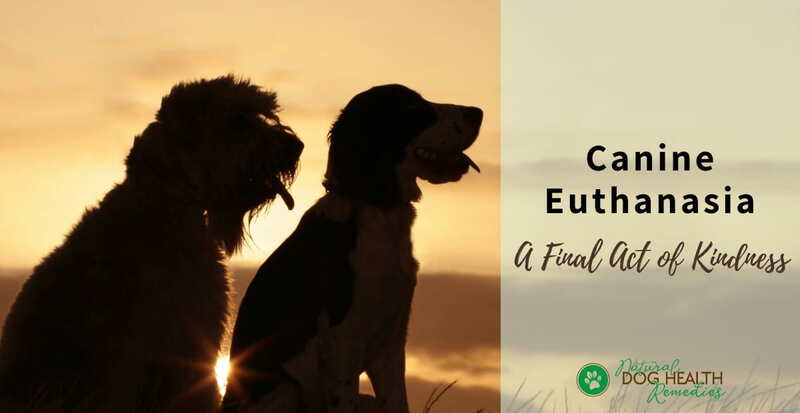 Canine euthanasia - putting a dog to sleep - is a decision that most dog parents do not want to have to make but unfortunately will probably need to face. For dog parents with an old or terminally ill dog, the decision for euthanasia may be more immiment. But even for dog parents whose dogs are young and healthy, accidents could occur and the decision to whether or not euthanize a seriously injured dog may fall upon us any time. How is dog euthanasia actually done? What to do with the dog's remains? When Should You Consider Putting Your Dog to Sleep? Euthanizing a dog is a very personal decision - no one, not even your vet, can make that decision for you. It is indeed very difficult to decide the "best time" to put your dog out of his misery. Many veterinarians suggest that we should consider letting go of our pets when they can no longer enjoy a reasonable quality of life. 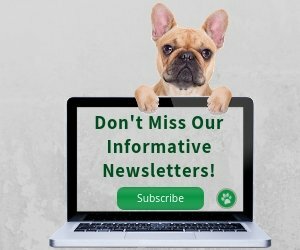 Can your dog still eat and drink normally? Can he move around by himself without difficulty or too much pain? Can your dog go to the bathroom or does he soil himself? Is he in constant pain and distress even with pain relief medications? Can he still recognize you and other family members? Or does he show signs of aggression towards you and others? If treatment is to be continued, will the cost be unbearably expensive? If his conditions can be managed by medication for the time being, will your dog become chronically ill, or become unable to care for himself? Will providing continuous care create serious problems for you and your family? I have prepared a checklist to help you arrive at your decision. Download it here. It's not easy but try to answer all the questions honestly. How is Canine Euthanasia Actually Done? 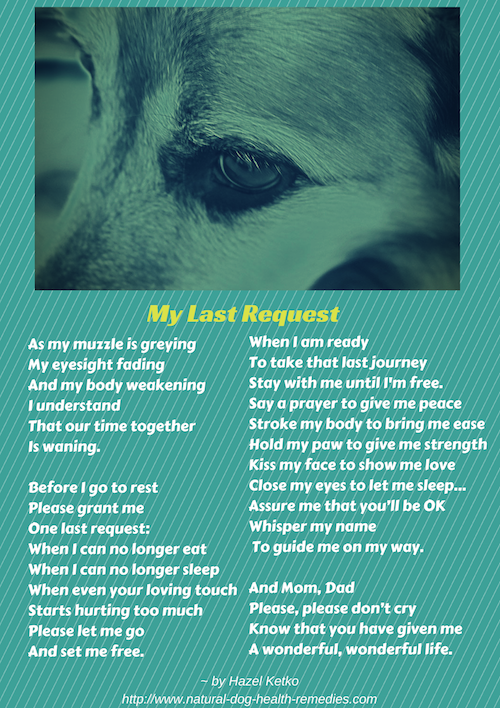 Here is a poem that I have written from a dog's point of view. Hope it helps. Once the dog is sedated, the vet will proceed to inject the euthanasia drug, which usually is an overdose of phenobarbital. This causes the dog's heart and breathing muscles to stop. The drug may be given to the dog as an injection, or it may be given via an IV catheter. Within a few seconds (15-60 seconds), the dog loses consciousness, slumps over, and soon afterward the vital functions cease. It is considered painless. There may be muscle twitching - While brain death occurs within seconds, continuing electrical activity in muscles may result in muscle twitching. There may be a last reflex gasp - If the respiratory muscles are affected by the electrical activity, there can be a gasping breath which may occur up to ten minutes after death. The dog may release his bladder and/or bowel contents. Read my personal experience on euthanasia when we had to put our 15-year-old dog Hana to sleep. Homeopathic remedies can be used to help a dying animal. Please note that the homeopathic remedy does NOT cause death. It is NOT a drug to euthanize a pet. 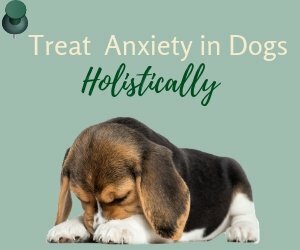 It only helps ease the transition by relieving pain, anxiety, restlessness and makes the process as smooth as possible so that the animal can pass peacefully. If you are considering euthanasizing your dog, perhaps it is a good idea to find a holistic vet to perform the procedure. That way, s/he can advise you on the proper choice of a homeopathic remedy that is suitable for your dog after considering the dog's mental and physical states at the time. Arsenicum album: The transition to death is frightening even for animals. 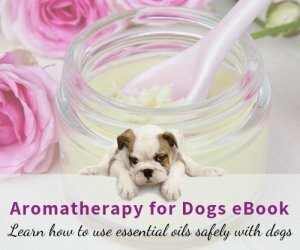 This remedy is extremely helpful because it can help to calm a dying dog who is restless and agitated because he is in a state of fear. Tarentula cubensis: This is another remedy that is associated with the dying process. It is helpful when the dog is in great pain and is struggling. This remedy is particularly helpful in the very last stages of dying, such as when a dog is dying from terminal diseases like cancers. Pulsatilla: This remedy is useful for a dog who is whimpering, complaining, or wanting to be held. It is also useful for the stage right before death when breathing is loud and labored. If you have an older dog or if your dog has been diagnosed with a serious disease such as cancer, it is better to think ahead and decide what to do in case you need to put him to sleep. Of course if euthanasia was performed due to serious injuries caused by an accident, you would have to make a quick decision as to what to do after his passing. Do you want to have his body cremated? Would you like to have his ashes back? If so, a private cremation will be carried out, and it takes about five to seven days for the ashes to return home. There are now many options for taking care of a dog's remains, for example, besides cremation, there are also memorial gardens, and cemeteries for pets. Discuss with your family ahead of time and make the necessary arrangement before euthanasia. Losing a pet is of course sad and painful. 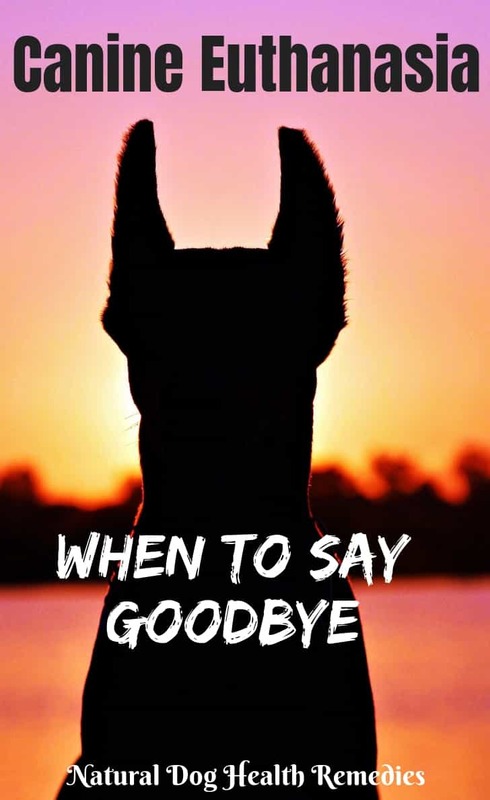 Some dog parents also have a tremendous feeling of guilt after having to put their pet down because they feel that they have taken the life of their pet. Very often, dog parents think that they have euthanized their dog "too soon" or for "selfish" reasons. Many have doubts as to whether they did the right thing, or they keep wondering if they could have done more or tried harder. Please read this page to learn more about the grieving process and what you can do to deal with the emotions. I have also set up this Pawsome Angels Pet Loss Support Group to support dog parents who have lost, or are going to lose, their beloved dogs. It is very helpful if you write about your feelings in a journal like this one.